Today we're going (virtual) thrift shopping together! We'll be stopping at two different Goodwill stores today. 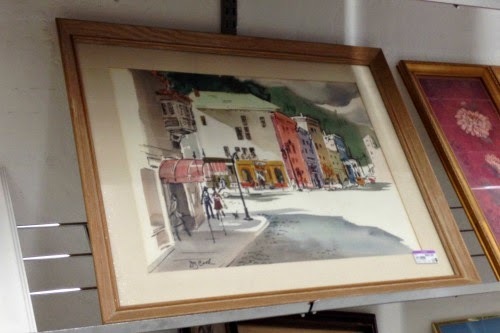 I'm lucky to have four within five miles of my house (two of them are less than two miles away), so I spend a lot of time at Goodwill. Every other Saturday is 50%-off everything, but it's always crazy busy in the morning/early afternoon. I usually don't go until later in the day, but I still find some good stuff (like my ironstone score a couple weeks ago). Does your Goodwill do half-off Saturdays too? 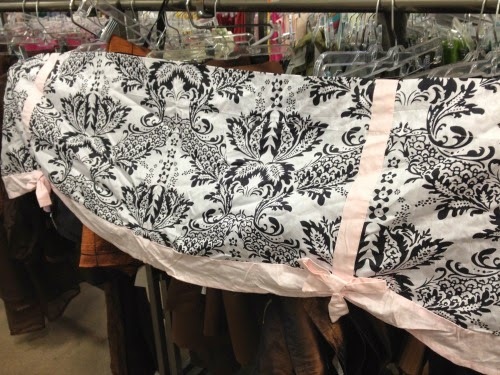 I love this black and white damask valance. The pink accents are so cute and would be perfect for a girl's room. They even had a pair of them! $2.99/each. I also love these handmade knitted blankets. They would be so cute in a nursery (thinking of you, Vel). 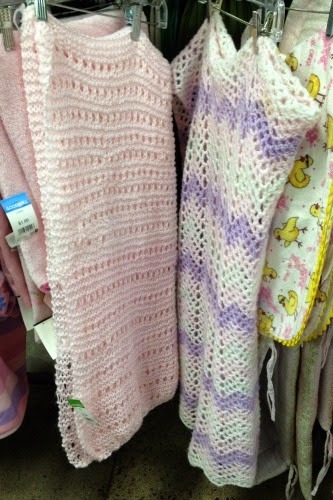 The pink one was the softest, most delicate blanket I've ever touched ($3.99) and who doesn't love white, pink and purple chevron ($4.99)?! 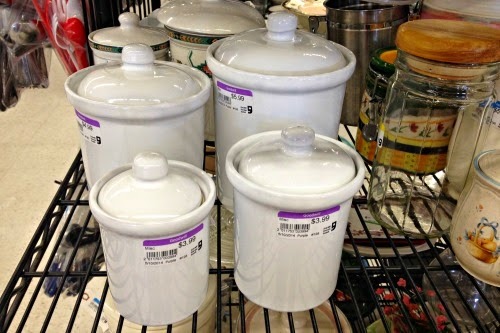 This set of white canisters would work in almost any kitchen. If you wanted to jazz them up a bit you could add vinyl lettering, chalkboard labels, paint stripes, paint just the lids, etc…so many options! It would be $18.96 for the set of four. I really liked these coffee cups ($1.99 each). The pattern is Blue Willow and these were made in England. There was a set of four and I’m pretty sure I saw the matching saucers in the next aisle. 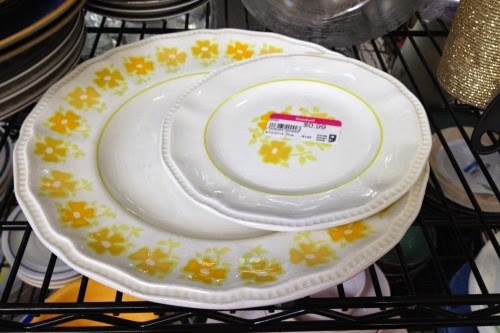 I didn't find any white ironstone on this Goodwill trip (you can see my collection here), but I did find a couple of other pieces for reference. Here are a couple examples of ironstone pieces that aren't white. The dinner plate was $1.99, the smaller plate was $0.99, and the creamer was $1.99. 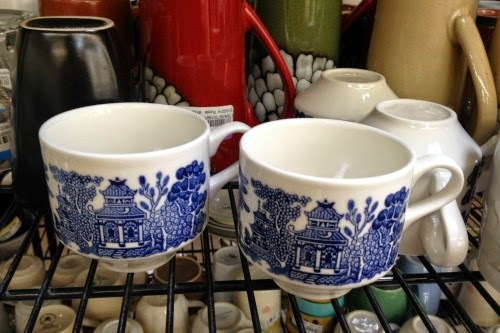 Actually, I think the cups above are ironstone too! This picture could use an updated mat and frame, but I like the artwork. It's a large piece, but I still don't think I'd pay $49.99 for it, but I'm also cheap. I'd definitely wait for half-off day for this piece. 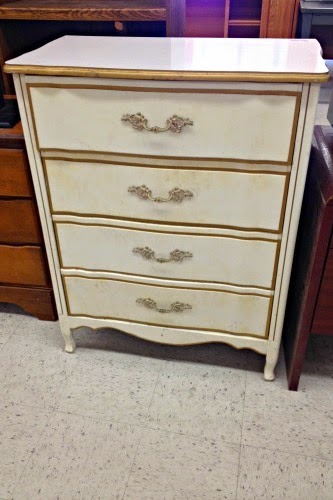 This dresser was in pretty rough shape, but I've seen some really cute makeovers on similar pieces, such as this mint green one. It was only $19.99 and I thought about buying it, but I don't really have a place for it. I'm kind of a book buying addict (one of the reasons I'll never get a Kindle), so of course I brought home a few books. The Pride and Prejudice "sequels" were $1.99 each. 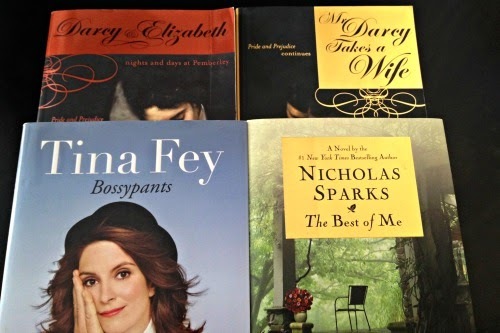 Bossypants and the Nicholas Sparks book were $2.99 each. 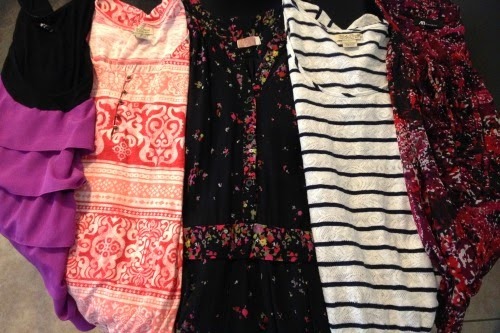 I also found a dress ($9.99...ugh), 2 Lucky Brand shirts ($6.99 each) and two shirts for work ($5.99 for the purple ruffled shirt and $4.99 for the other). So, do you shop at Goodwill? Any good finds lately? I wrote a great comment...where did it go? Okay, first comment was lost. Did you see the thrifted items I posted on Instagram this weekend? Too fun! 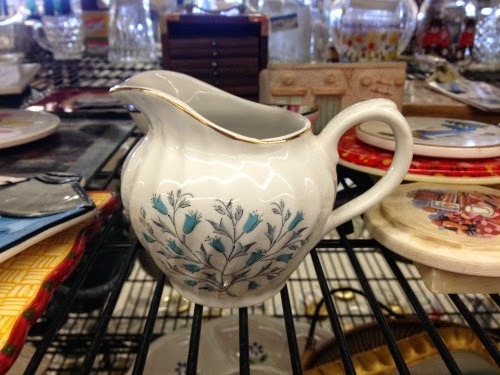 You should join "Thriftanista Social Club" on facebook--it's a group my thrifting sensei started. She and I had a blast at Savers this weekend. Lots of quality finds! I did see your thrift finds! The shoes you found are so cute! I love Savers! I go there almost every Saturday. Great finds! I don't venture in to the Goodwills around me very much at all...but I think I need to start! 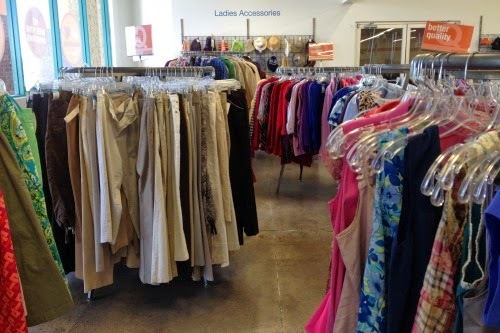 We even have a Goodwill Outlet not far from me, and I've heard you can find some really great deals there sometimes too.